Are you a couple looking for a unique date experience? A group of friends planning a day out? Or perhaps a company searching for an unforgettable team building adventure? Well, whoever you are, we’ve got just the thing for you: our amazing Graffiti workshop Berlin! We invite you to join us for a 3 hours Workshop Graffiti in Berlin, a city that’s legendary for its Street-art scene. In fact, here on the streets of Berlin, many pieces of graffiti become much-loved landmarks in their own right. On this Street Art Workshop Berlin, you’ll get to learn all about the Graffiti culture that makes this city unique. Plus, you’ll have the chance to make your own- perfectly legal- mark on the city for yourself! 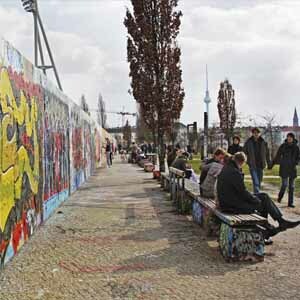 Once you’ve book your graffiti workshop place, through our calendar, we’ll meet at Prenzlauer Berg’s famous Mauerpark. Located close to the former Berlin Wall, and home to a buzzing Sunday flea market, this part of town is a real hub for street artists. There’s no need to worry about bringing anything along- we’ll provide you with all the materials you need for our graffiti workshop. After teaching you about the amazing culture that lies behind Graffiti, we’ll then take you through fundamental Graffiti techniques and skills. We’ll then give you a chance to start sketching your designs for your very own Workshop Graffiti Berlin. Once you’re all set, we’ll then take you to a specially prepared section of the park’s graffiti wall. When we get there, it’s time to shake up those cans and start spraying! There’s nothing quite like seeing your designs come to life on such a huge scale, and when you’re finished, you’ll know that plenty of people are going to admire them! 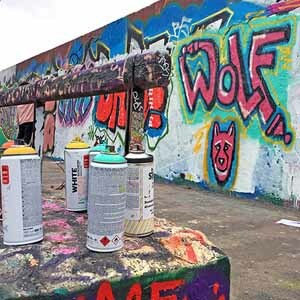 These graffiti workshop is the perfect opportunity to let your creative side run wild, and gain an added appreciation for the artworks that surround us every day. If you’d like to learn more about our graffiti workshop, or book a place, then have a look on our calendar or feel free to contact us!
" WE INTRODUCE YOU TO THIS AMAZING CULTURE THROUGH OUR UNIQUE GRAFFITI WORKSHOP"
" LEARNING BY DOING, THAT IS OUR GRAFFITI WORKSHOP "